We specialize on building industrial systems with a stable process based on the most recent inventions and developments in Technology. We are developing and manufacture systems for a specific applications, based on details about your requirements, such as: parts drawings, throughput requirements, material, and density and porosity requirements, allowed oxide content, dimensional tolerance and surface integrity parameters. Laser Photonics greatest strength in 3D metal printing systems remains its cultural flexibility to design application specific systems using a system vs application bottom’s up approach matching the dynamics of the application to our portfolio of build-block technologies including 3D print methodologies, software design/laser processing strategies, advance additive manufacturing laser technology and metal powder expertise. During the system design review stage, laser Photonics team of scientist select the most suitable portfolio of options matched to the application in terms of accuracy, metal composition, body material density and integrity, internal geometry, oxide content, desired throughput, product shape, and dimensions. The XYZ build plate and overall system architectural strategy is designed to support the manufacturing mode of the application in terms of object size, throughput rate, and forecasted volumes. We design each system based on the part specification taking into account the attributes of the desired metal type recognizing that each material has its own unique melting point, coefficient of thermal expansion, and density. The laser parameters are matched to the metal powder’s properties gently easing the solid through its transition state to a liquid at the rate of the material instead of the processing speed of the laser. The result is a high quality part free of the defects associated with today’s metal printing systems. Our discussions allow customers to minimize powder consumption, reduce inert gas consumption, optimize throughput verses surface roughness, minimize powder residue in the process chamber, define optimal laser power requirements, and reduce system costs in relation to customer applications (design for a warhead is different from the design of a medical implant, even if they have similar horizontal cut dimensions). Combined with our extensive experience of integrating Vision Systems into laser equipment, our 3D deep engraving capabilities experience, submicron accuracies of non-dimensional Zero Width Laser Cutting Technology™ equipment together with real size shipbuilding laser cutting machines, these established proprietary advantages position Laser Photonics Corporation as one of the preferred premium suppliers of revolutionary 3D Metal Fusion Systems designed for parts quality manufacturing. 3D Laser AM technology can produce unimaginable shapes not only for overall appearance, but design engineers can create the content, specifically meeting the tactical goals and requirements. The same shape of warhead, carried by the same missile can be used for totally different purposes: air to air weapons just need to damage the target; bunker busters have to penetrate deep into the concrete and the right design of warhead content will create the specific blast pattern to address the tactical goal and create the maximum, or desired disabling of the target. 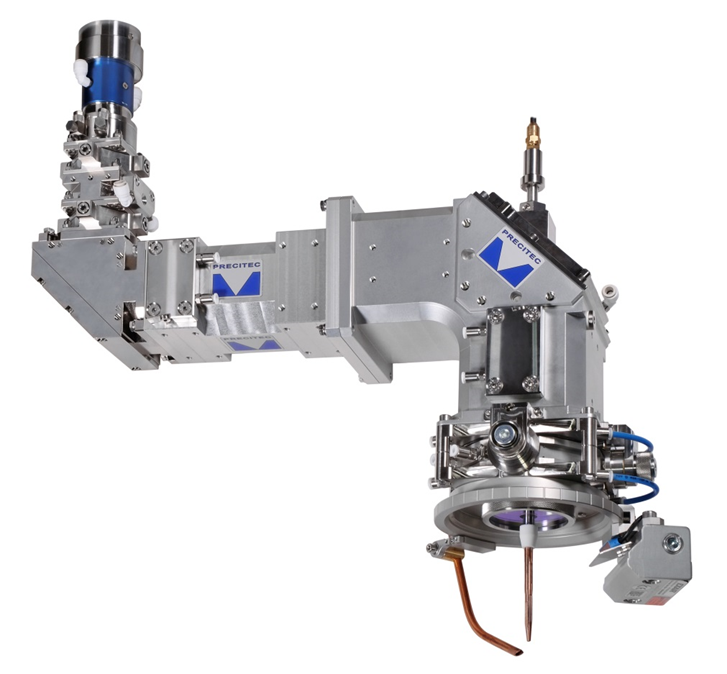 Excalibur P8 – specialized 3D industrial platform for metal laser sintering enables completely new and previously unknown design capabilities for warhead engineers. Up to now there is no 3D laser metal sintering system designed and built for specific warhead and military munition applications. With Excalibur P8, Fonon is pioneering the challenging task to tool warheads using its vast experience with design and manufacturing of application specific laser systems for various material processing applications. Fonon designs, manufactures, and tests heavy duty industrial-grade universal 3D laser printing platforms optimizing the system configuration to a specific product family with common requirements. Excalibur Warhead platforms are available in 2 size configurations with the P8 system fitted with 2 multi-kilowatt lasers printing pairs of warheads in parallel across a bed of 4 warheads in series for a total of 8 warheads. In a similar manner, the P18 system is fitted with 3 multi-kilowatt lasers printing 3 warheads in parallel across 6 warheads in series for a total of 18 warheads. Both platforms have been designed, manufactured and subjected to both reliability and functionality performance tests confirming the viability of the system architectural use as a warhead AM system or other products with similar specifications. In addition, the Excalibur manufacturing system can be configured for any other large sized product including turbine blades, automotive engines, numerous defense and aerospace components, heavy industrial vehicle, or ship parts. Laser Photonics using the company’s existing 5’ x 10’ powder bed footprint that provides flexibility and efficiency of operation. The standard footprint is configured into two (2) separate 5’ x 5’ chambers. Both chambers will support any combination of the five (5) build plates. The concept is to have both modules under continuous operation. While chamber #2 is preparing for the next build layer, the laser is actively processing the material in chamber #1 keeping the laser in constant operation. Using the established footprint reduces development costs. The powder bed platform will load/unload both build plates from one side via a standardized shuffle table system designed to support the maximum weight of the two largest loads combined. All applications benefit from the circular laser focus melting the wire. We solely develop all 3D Direct Metal printing systems for specific customer requirements, targeting maximum performance for 3D printing of specialized designs, parts and applications. Our designs allow customers to optimize expensive nano powder consumption, reduce inert gas flow rate, optimize throughput verses surface roughness, minimize powder fill up volume in the process chamber, define optimal laser power requirements, optimize system costs in relation to application (design for the warhead 3D metal sintering system is different from the design of medical contact pads mold forms prototyping, even if they have the similar horizontal cut dimensions). From tooling inserts featuring conformal cooling channels, through to lightweight structures for challenging and critical high technology applications, 3D Laser Metal Printing significantly reduces the constraints on designers. This design freedom results in optimized structures and shapes that would otherwise be constrained by conventional processes or the tooling requirements of large volume production. 3D Laser Metal Printing helps to reduce lead times, reduce tooling costs and permits the creation of designs not previously possible.